Many of us have followed the “Antiques Road Show” on television hoping to spot a familiar family heirloom worth enough money to change our lives. At the Henry B. Plant Museum they have their own “Antiques Road Show” called Antiques Evaluations Saturdays. 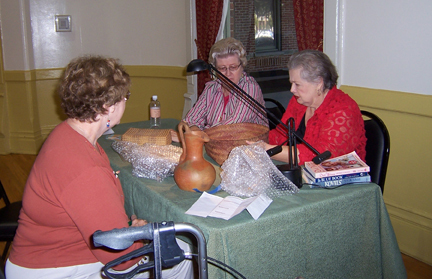 Seven Saturdays a year skilled appraisers donate their time to evaluate the community’s possessions. You can bring your favorite treasures to the Music Room in Plant Hall at The University of Tampa for a verbal evaluation. At 10:00 a.m. on Saturday, November 20, local appraisers will be available to answer your questions. Evaluation cost is $5 per item, which goes to the restoration and renovation of the museum - always a great cause! There is a limit of four items per family. Tickets will be sold on a first come first served basis, and will be sold between 10:00 am and Noon. If furniture is too large, bring a good photograph and a drawer or door from the piece, if possible. PLUS, afterwards you may visit the Museum for free. very, very cool! And, all proceeds benefit the Henry B. Plant Museum. Parking is available in the Faculty and Staff parking lot on the west side of Plant Hall. So, have fun, and I&apos;ll see you out there. Until then, keep checking back for more Tampa Bay Entetainment options.